For his monumental achievements and vast influence the Church of Virus voted for Turing's illumination as a VirianSaint on March 21, 2010. Meridion vote. Often considered the founder of computer science, Alan Turing's work in mathematics led him to envision the first digital computer. The Turing Machine would read a series of ones and zeroes, interpreting them to perform an ordered and repeatable sequence of steps. His machine introduced the concept of the multi-purpose computer. His concepts introduced the algorithm as a means of solving any problem by way of a sequence of well-conceived steps. Turing's interest in biological processes and his belief that a machine could be created to mimic the process of the human brain ushered in the era of artificial intelligence. He conceived of the Turing Test, a method of proving or disproving the presence of intelligence in a machine. If an objective observer, by way of questions posed from a keyboard, could not reliably identify a machine from a person, the machine would have passed the Turing Test. Successful achievement of the test remains a primary goal of today's artificial intelligence researchers. 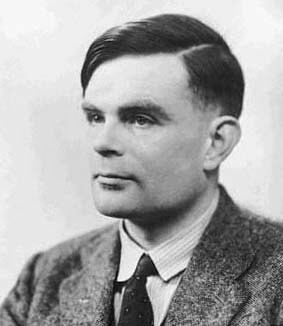 During World War II, Turing was an instrumental member of the team from the Department of Communications in Great Britain that deciphered German codes generated by the Enigma machine. In recognition of his monumental achievements in the advancement and realization of computers and computer science, significant contributors to the field are recognized by the A.M. Turing Award. Bestowed by the Association for Computing Machinery and sponsored by Intel, the award recognizes major contributions of lasting significance to the computer field. Its list of recipients constitutes a veritable Who's Who of computer science. Last edited on Tuesday, March 30, 2010 12:52:09 am.